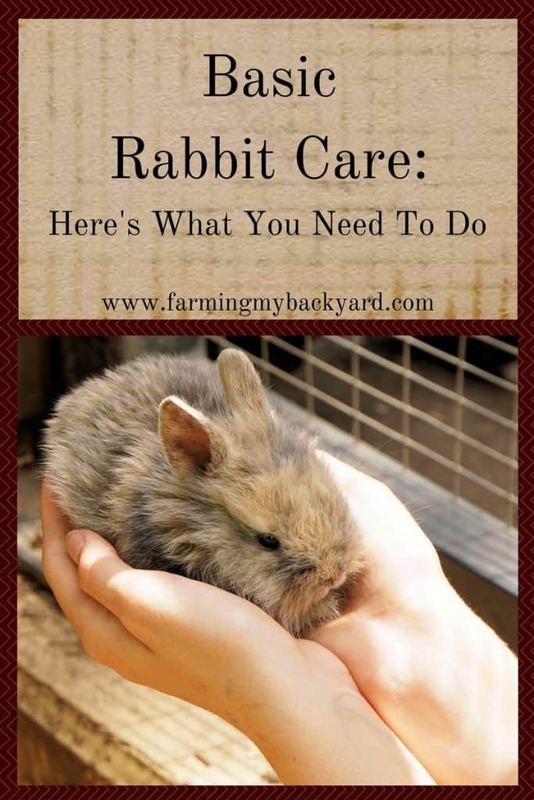 Basic rabbit care is pretty simple, and doesn’t always take a lot of time. Raising rabbits can be a fun way to add livestock to your urban farm. They are small so they don’t take up a lot of space. They are quiet, so you don’t have to worry about bothering the neighbors. You can start small with just a breeding trio! If you find rabbits are right for you, you can expand your rabbitry easily. Just start with a small investment in quality breeding stock before you scale up. Here’s what you need to do to starting raising your own meat rabbits. Decide what breed is best for you. Before you bring your rabbits home decide what purpose you want them to fill. Different breeds excel in different areas. All rabbits can be eaten for meat, but some breeds grow larger, faster than others and are more cost effective, such as New Zealands, and Californians. English and French Angora rabbits can be raised for fur to be spun into yarn. Other rabbits have sweet temperaments and make ideal pets and companions such as lop ears and dwarfs. Some are bred for their pelts such as New Zealands and American Chinchillas. All breeds can be raised for show. Some are even multi purpose. I raise American Chinchillas mainly for meat, but they also have sweet personalities and beautiful pelts. No matter what purpose you choose, if you decide to breed your rabbits you will have culls that you need to deal with. The most effective way is to eat them, because not every rabbit will be a sweetheart, a great breeder, or a show champion. Have a plan to deal with unwanted rabbits BEFORE you bring them home. Know how to process, or who you can hire BEFORE you have an injury, or a surprise litter. Stuff happens, and rabbits can be fragile. Sometimes they are scared by the simplest thing like a dog barking. A panicked rabbit can break their own back just by jumping in their hutches. You are like their god; they look to you for mercy. Don’t let them down in an emergency. I have had good luck talking to people and getting word of mouth referrals. We asked at our feed store about it and got the number for the guy we have do most of our chickens and rabbits. I also found an acquaintance who was willing to come help walk me through doing it on my own the first time. If craigslist is big in your area, you could do a search for meat rabbits there and start connecting with sellers in your area who may be willing to let you come help and learn. Also YouTube has some good videos. If you are proficient with chickens, it will probably be easier to learn how to do it from a video. However, I think a real life mentor is much better for those of us who are very new to butchering anything. I do think watching videos of the process can help you decide whether it’s something you want to learn how to do. Here’s a video one by Daniel Salatin. Another method is “broomsticking”, and you can see it in this video. There are a few ways to tan the pelts, but I’ve only tried egg tanning. Here’s a step by step tutorial from Instructables. And if you prefer video, here’s one of the process. If you are interested in alum or acid tanning check out these recipse from Mother Earth News. Feeding rabbits can be super easy, or you can really delve into the science of it. Good nutrition is crucial to rabbit care. Without it they will not breed well, and they are more susceptible to disease. Rabbits will usually thrive on a diet of pellets, hay, fresh water, and a mineral spool. They can tolerate occasional treats, but any sweeping changes to their diet can cause digestive stasis and can kill them. There are people moving away from relying on prepackaged soy and corn based feeds who are learning about heritage ways to raise rabbits. Some rabbits are raised on pasture, although it can be difficult to contain and fence them. Another option is to do a cut and carry method to bring forage to their rabbits. If you do not want to feed pellets, start with alfalfa hay and rolled oats as your basic feed. The book Domestic Rabbits & Their Histories by Bob Whitman has a great breakdown of feed mixes based on area of the country and the life stage of the rabbits. Based on the book I have used a mix of black oil sunflower seeds, wheat berries, rolled oats, flaxseed meal along with hay and minerals for my rabbits. I strongly suggest you keep good records to see if mixing your own feed is a good option for your rabbits. Rabbits need fresh water, always. Rabbits must have water at all times. If they don’t drink they won’t eat, and they can die from GI stasis very quickly. The most popular option is water bottles with ballpoint metal tubes. Crocks are good in the winter because the rabbits can lick the ice and it’s easier to get the ice blocks out of, but bottles stay cleaner and spill less. Rabbits can drink out of automatic waterers, which would be a nice time saver that I might set up someday for my own bunnies. However, reduced water intake is the first clue that a rabbit is ill. Individual waterers helps you keep an eye out for potential issues. Give your rabbits appropriate housing. Housing can be minimal or elaborate for rabbits. Part of the appeal of rabbits is that they can be kept in hutches and only need 9 square feet per rabbit. Their small space needs combined with their quiet nature makes them an ideal livestock animal for the city. Rabbits do need some protection from the weather. They can easily overheat in the summer, and need to be kept out of the wind and wet during the winter. They can breed year round, but babies are easily chilled in winter months. Also, sometimes bucks can go sterile during times of intense heat. Because of these reasons, there tend to be more babies in the spring and fall. If you want to breed through the winter you may need to use artificial lighting to extend daylight hours for your rabbitry. If you use hutches, make sure they are sheltered on three sides. Use 1/4 inch hardware cloth for any open areas, and provide areas for the rabbits to get off the wire so that they don’t get sore hocks. Depending on the size of your breed, you may need larger than 9 square feet. The rabbit should be able to stretch out fully to lay down in the hutch. It should be able to stand on it’s hind legs in the cage without it’s ears touching the roof. Ideally they would have two levels that they could jump between, a nest, litter box, or toys to keep them entertained. You can also fill the hutch with hay to allow the rabbit to dig a bit and protect them from excessive wind in the winter. Another style of raising rabbits is the colony method. This method has several advantages over hutches in that it allows rabbits a more natural living setting, more space to move around and associate with other rabbits. The downsides of using a colony method are it requires more space and can be difficult to predator proof if it is an outdoor area. You also have less control over breeding lines and timing in a rabbit colony. Some good resources for rabbit care in colonies are the Facebook groups Rabbits in Colonies, and Colony Raising Rabbits. Are you able to provide basic rabbit care? Then raising backyard rabbits may be right for you! Rabbits produce, meat, fiber, fur, and manure with a little space, feed, and effort. 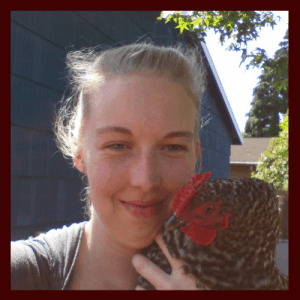 They make a smart addition to a small scale homestead, and I certainly enjoy raising mine. Do you raise rabbits? Leave a comment and share about your backyard herd! My husband and I have been considering adding rabbits to our small homestead, and your article was so well-written, I think I may actually be able to talk him into it! Thanks!! Thanks for all the bunny information. Do you butcher your own? If so, can you provide a guide? Or do you have a recommended link? What do you do with the pelts? I can dispatch and dress out meat chickens, but I’ve never done this with a mammal. Thanks very much! Also YouTube has some good videos. Here’s one by Daniel Salatin: https://youtu.be/8OkXszeclxs Another method is “broomsticking”, and you can see it in this video: https://youtu.be/_NO-DQXXzis. If you are proficient with chickens, it will probably be easier to learn how to do it from a video. I think a real life mentor is better for those of us who are very new to butchering anything. There are a few ways to tan the pelts, but I’ve only tried egg tanning. Here’s a step by step tutorial: http://www.instructables.com/id/How-to-tan-rabbit-hide-with-egg-yolk/ and here’s a video of the process: https://youtu.be/w0fevY7oA3o I believe tanning with alum gives a softer pelt, but I haven’t personally tried it. I have the sane question. How do I find a butcher? I shared some resources in my comment to Toni, but I’ll go ahead and add it into the main article so that it’s easier to see. Thanks for asking! I’m so confused. How can you people say how “cute and sweet they are” and then turn around and butcher them!?!?!?!? Honestly, I DONT understand HOW you can take such an innocent animals life. One that has trusted and relied on YOU and YOU take ITS LIFE!!!!!! Im sitting here with my husband with out two precious dogs and I’m TRYING to imagine HOW YOU could kill something that is so sweet and innocent?!?!?!?! It really blows my mind HOW YOU can do it. I’m just saying……..
“With OUR two dogs” is what I meant to say. How does anyone face the fact that by their existence some other living creature has had to die? Even if someone were to eat a vegan diet based on soybeans and grains it causes sweet innocent animals to die. Animals in the fields die from plowing and from loss of habitat. Animals in the ocean die from toxic run off of chemical fertilizers. Meat in the store was once a cute little animal too. But chances are it had a terrible, miserable life. It’s not easy to raise your own meat animals, but if you want to understand HOW, it’s by understanding that my life requires other life to end. At the very least I can make sure it has a good life, a happy life and a swift end. But yes, it’s a million times harder to look it in the eye, say thank you, and then do the deed yourself instead of happily living in oblivion and denial. Thank you Kathryn for your well-written and sincere reply. Thanks Elizabeth. I understand that raising your own meat is not for everyone, however the small farmers I associate with care very deeply for the well-being of their animals and certainly don’t find it easy. You got me when you said that it’s critical for rabbits to have access to water to make sure that they won’t die from GI stasis. I will share this with my brother who’s planning to own a rabbit soon. He said that he wants his rabbit to be in good health condition for years to come. By the way, he said that he wants to make sure that his rabbit will look clean and free of skin problems, so it’s best for him to find a rabbit groomer as early as now. Yes, if he has Angora’s that will be very important!